March celebrates Women’s History Month, but do we really need it any longer? After all, so many of the campaigns and struggles of earlier generations of UK feminists have now been won: women’s right to equal pay, access to higher education and equality of opportunity. I believe we do. It offers a time for remembering, for commemoration and celebration. Women’s past achievements are too easily neglected and so forgotten. This becomes crystal clear when we look at exactly how we remember our pasts, and how those memories are kept alive, for successive generations. The woeful under-representation of women in public history has been highlighted just recently in Manchester. Even though Manchester has always been ‘suffrage city’, there was just one statue erected of a woman: Queen Victoria. So a public poll was held with five candidates, including founder of the suffragette movement Emmeline Pankhurst, and Margaret Ashton, Manchester’s leading suffragist, anti-war campaigner and the city’s first woman councillor. In the poll, Emmeline came top, gaining over half the votes cast, so her statue will go ahead. The first woman to get a statue in Manchester for over a hundred years! Of course, Women’s History Month celebrates far more than just the suffrage campaign. But in Edwardian Britain, Votes for Women was a spectacularly hard-fought campaign. International suffragists, looking across the English Channel, could not believe their eyes. Here was Britain, the world’s first industrial nation, one that could boast women doctors and surgeons and many tax-paying women. Yet it had become ‘the storm-centre of the women’s rebellion’. As one German suffragist wrote: ‘the storm-centre of the warfare which waged…was England…Delicate women…allowed themselves to be thrown into prison, went on hunger-strike to the verge of death’. This history, of such intense interest to both ourselves and international scholars, must be remembered. Yet so often the places, the collections, the objects that help preserve those memories grow neglected, decayed, imperilled. It was such crises that bedevilled the Fawcett Library (named after Mrs Fawcett, leader of the constitutional suffragists). Its magnificent collections – of banner and badges, of photographs and minute-books – were threatened with dispersal. Only after massive public campaigns to save it has the Fawcett, re-named The Women’s Library, at last found a secure home in the London School of Economics: [email protected]. Similarly, the Manchester home of Emmeline Pankhurst, where she formed the Women’s Social and Political Union (WSPU) in October 1903, fell into disrepair in the 1970s. It was little more than a dejected ruin. Indeed, it was threatened with demolition in 1980 by an avaricious neighbour, an ever-growing hospital, until a great public outcry by feminist historians and architectural conservationists helped save it. Since then, thanks to hard graft by dedicated and imaginative volunteers, the Pankhurst Centre (as it soon became) was saved and survived, albeit on a shoe-string. Today, its small heritage museum is open to visitors and the Pankhurst Trust has put in a major HLF bid for restorative work, in time to mark the 2018 centenary celebrations of women over thirty winning the right to vote. Women are indeed a ‘people of memory’, whose key ‘sites of memory’, the Pankhurst Centre, the Women’s Library’s collections, and many others, it is imperative to preserve. Shortly after Women’s History Month, the House of Commons is hosting a conference on Monday 4 April, Vote 100: Women’s Suffrage regional historians’ conference, to help prepare for centenary celebrations in local towns and cities. I will talk on Northern Stories: radical suffragists and census evaders and I hope to see you there. For further information visit the Eventbrite page, here. 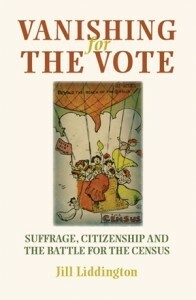 Vanishing for the Vote: Suffrage, Citizenship and the Battle for the Census by Jill Liddington is available now.